GR: Για να φτάσετε στο Ποδηλατοδρόμιο στο Ολυμπιακό Στάδιο χρησιμοποιείται την πράσινη γραμμή του ΗΣΑΠ και σταματάτε στη στάση ΕΙΡΗΝΗ. EN: For direct access to the Olympic Stadium (OAKA), where the Alter Summit will be held, you can take the Athens Suburban Railway from the airport to the Nerantziotisa station; from there change to the Green Line (Athens Metro) to Irini station. To get to downtown Athens you can take the Blue Line (Athens Metro) to Syntagma station. 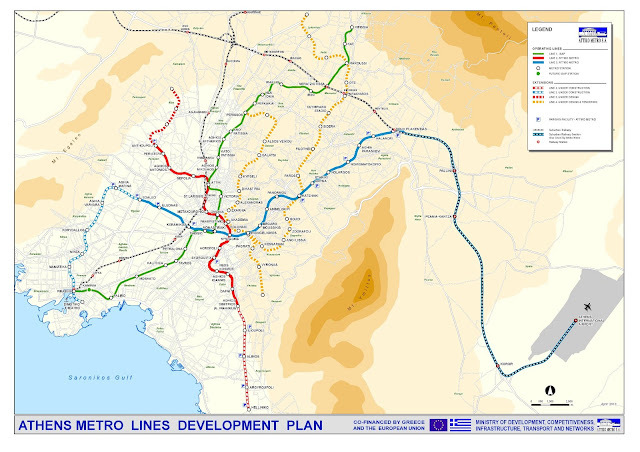 FR: Pour aller directement par aeroport au Stadium Olympic (OAKA), ou est l' Alter Summit, prenez le train (Suburban Railway) par aeroport jusqu' a station Nearntziotissa, ou il faut changer et prenez l' Athenes metro Linge vert, jusqu' a station Irini. Pour aller au centre d' Athenes, prenez la Ligne bleu du metro jusqu' a station Syntagma.